This plan is based on the Classic Bunk Beds at ana-white.com. If any of these instructions don’t make sense, read through that plan for a better understanding. The finished bed disassembles into 8 main sections, plus the mattress support slats. Overall dimensions are just under 10′ by 3’8″ by 6′ tall. Note: The quantity of 52 is an estimate based on total footage required. This will allow approximately 8″ of waste per 8′ board. Increasing this to 54 allows for up to 11″ of waste per board. Remember to cut the longest pieces first. Build the end pieces. One is full height, the other is for the mid bunk end. On the verticals, make marks, from the top down, at 12¾”, 25½”, and 38¼”, with two more on the full height vertical at 51”, and 63¾”. The last mark should be 7” from the bottom of each vertical. Those marks are the top of each horizontal rail. With the cross rails centered on the face of the verticals, there will be 1 3/8” on either side. Pre-drill through the verticals and attach to the cross rails using 2” screws, and glue. Build the 2 inner cross sections. There is one full height, and one hanging section. Each rail is the same 12 ¾” apart like the end pieces, or 25½” where it skips a rail. 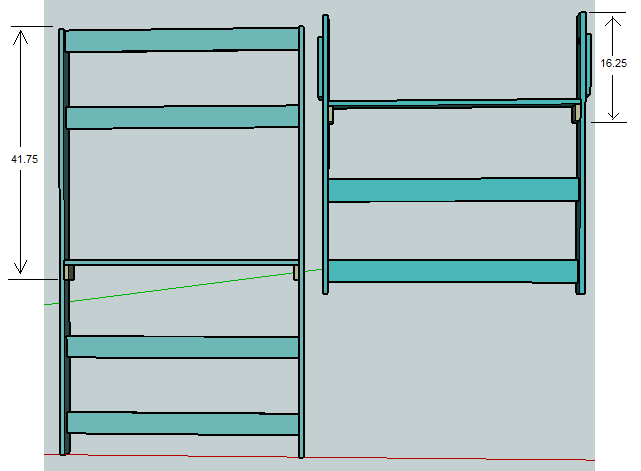 These cross sections each have one rail that is installed flat, that will end up being one of the mattress supports. A 2½” piece of 1×4 should be glued and screwed into the vertical directly below the flat cross piece on each side for extra support. 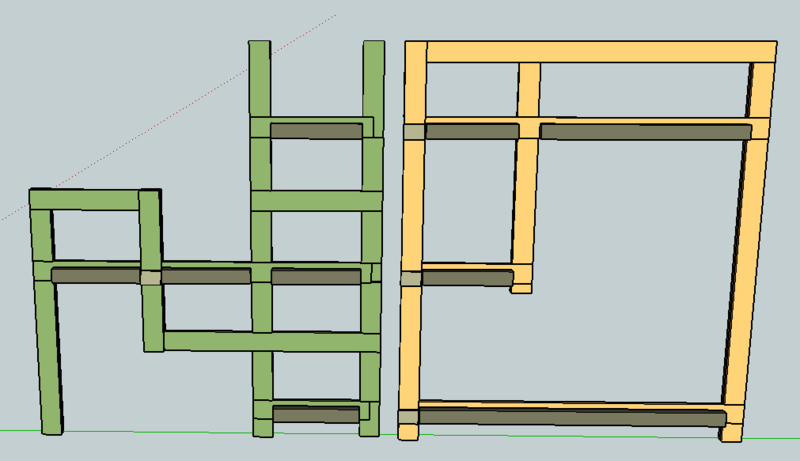 Attach the supports for the flat rails as shown, by aligning with the bottom of each rail. The top of the flat rail will be ¼” lower than the matching cross rail (comparing to the end pieces). Pre-drill through the verticals and attach to the cross rails using 2” screws, and glue. Use 1¼” screws for the small support pieces under the flat rails. The hanging cross section should have a 1” hole drilled just below the top safety rail (4½” from the top), where the bolt will go that connects the main pieces together. This is to allow the nut on the assembly bolt to be countersunk to keep it safely away from the person in the top bunk. The upper filler pieces, which are attached to the outside verticals in most places, are attached to these verticals as shown, 3½” from the top. At least 2 screws should be used near the 1” hole. The bolt will grab the surface of the filler piece when assembled, so this piece must be secured to the vertical with both screws and glue. Build the front and back double sections. These pieces need to be mirror images of each other. On the full height verticals, make marks, from the top down, at 12¾”, 25½”, 38¼”, 51”, and 63¾”. That last mark should be 7” from the bottom. Those marks align to the top of each horizontal rail. –the hanging vertical extends 1¾” below the mid bunk rail, allowing space for an assembly bolt. –one full height vertical and the hanging vertical are on the outside of the rail, and the other is on the inside. –the 3 main bed rails only cover half the width of the inside vertical. On the inside vertical, which goes next to the ladder, a 1” hole similar to the hanging cross piece is needed, along with the filler piece being attached to the inside rail 3½” below the top, using screws and glue. For all of the other filler pieces, 1¼” nails with glue can be used in place of screws to make assembly a little faster, since these pieces will not be subject to lateral stress. All nails and screws should go through the filler into the vertical to keep the heads hidden. Start by laying the two outside verticals on the floor, and lay the rails on top. After attaching, flip it over to attach the inside vertical. Build the front and back single/ladder sections. These pieces are also mirror images of each other. Make marks on the verticals at the same spacing as the double front/back sections. On these pieces, all of the main verticals are on the outside of the rails. There is a second vertical on the hanging support that goes inside the rail, which should be attached last. This inside vertical can be attached with finish nails and glue rather than screws, since the screw heads would remain visible, and this piece is less structurally critical. Align the bottom of the 2×3 with the bottom of the rails. Screw from the 2×3 side to keep the screw heads on the inside. Also attach 2½” inch sections of 1×4 to the inside verticals as shown to align with the 2×3 supports. There are 3 on each double section, and 1 on each single/ladder section. Drill the bolt holes. Bolts holes should be drilled about 1” below each bed rail, plus one below the top safety rail. This will place the nuts in a safe position directly below the cross rails. That is 4 bolts each in the 3 full height verticals (2 cross sections and the ladder overlap), and 3 bolts each in the 2 short verticals. Clamp 2 sections at a time together in their final position, and drill through both sections at once. Connect the slats together. Although the slats could be screwed to the slat supports after assembly, that would eliminate the ability to easily disassemble the bed. By simply be attaching the slats to each other, it will maintain spacing and still be easy to remove. 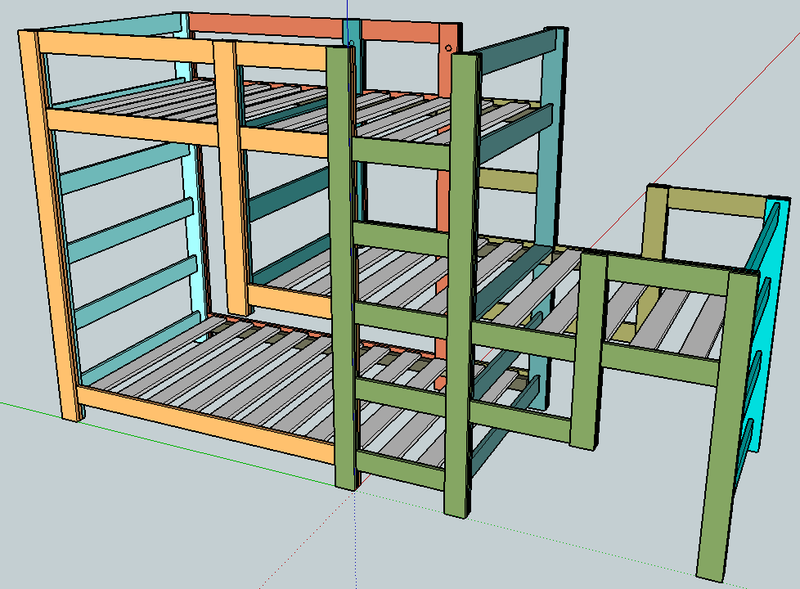 The slats for each bunk should be connected together in two groups, since the top bunks have a built-in slat in the middle. Lay a yard of cloth across 5 slats, properly spaced (about 3¼” between them) and staple to the slats. Four of the 6 groups will have a shorter piece in the middle. One will need 6 slats, all full length. 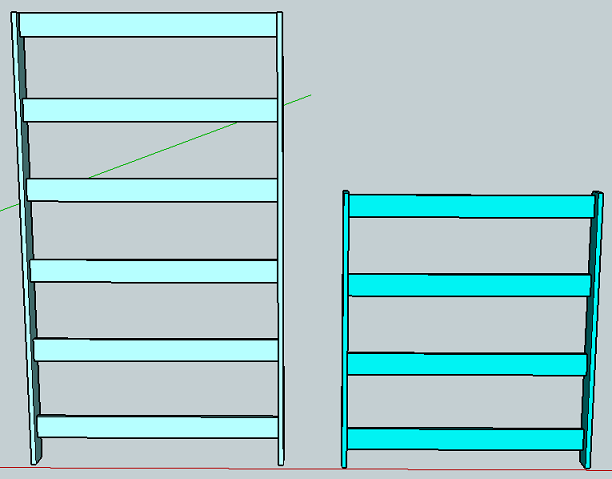 Or, as an alternative to cloth, use 2 extra 1x strips about 32” long for each half, perpendicular to the slats, and screw into the slats (these 1x’s will need to be on the bottom of the slats when in use). For the best view of the project, install the Sketchup program and download the Sketchup file for this project. Then you can pull the pieces apart, rotate around it, and even customize it for your needs. All of the 3″ bolts will protrude, since they need to clamp all 3 layers of wood. They are placed as best as possible, directly under the cross bars. The shorter bolts go on the top bunk, in the recessed holes described in step 2. For the shorter bolts, you can change that to 2″ so they will be completely recessed within the 2.25″ thickness of the 3 pieces. You’ll only have about 3/8″ of threads exposed, but that should be enough for the nut. The longer bolts cannot be shortened to 2.5″, because that would leave less than 1/4″ of threads exposed, which is not enough. I tried looking on sketchup but could not find the plans. What is it listed as? I downloaded sketchup app on my Android. I can’t pull the second apart. Do you know if that is a desktop only feature? Question — “6 – 1×4 x 3.5” feet” — should this read “6 – 1×4 x 3.5”” or “6 – 1×4 x 3.5 feet (42 inches)”?